For this year's massive Wörthersee gathering, Audi introduced the A3 Clubsport Quattro concept. A 4-door, 5 cylinder, 500+ Hp compact sedan. In other words, a true fun machine. The Audi A3 Clubsport Quattro concept is powered by a 5-cylinder 2.5 TFSI engine producing 518 Hp (386 kW) and 600 Nm (442 lb-ft) of torque. It sends it s power to all four wheels through a 7-speed S tronic gearbox. Thanks to its relatively low weight of 1,527 kg (3,366 pounds), the car can sprint from 0 to 62 mph (100km/h) in 3.6 seconds. It will keep accelerating until it reaches a 192.6 mph (310 km/h) top speed. More pictures in the gallery below and more details in the press release after the jump. Audi is presenting the A3 clubsport quattro concept at this year's Wörthersee Meeting in Reifnitz (Kärnten) from May 28–31. 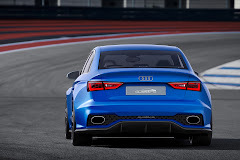 The concept study is based on the S3 Sedan* and has a five-cylinder TFSI engine under the hood producing 386 kW (525 hp). Visitors can also see the Audi TT quattro sport concept show car, which debuted at the 2014 Geneva Motor Show, and ten production models. “The Audi A3 clubsport quattro concept shows our car and tuning fans at the Wörthersee just how much sporty potential there is in the A3 family* and in our top?of?the?line engines such as the 2.5 TFSI. We have pushed the limits in every respect with this show car: power, dynamics, sound, design,” says Prof. Dr. Ulrich Hackenberg, Member of the Board of Management for Technical Development. 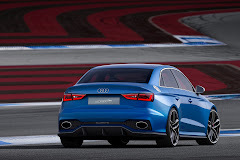 Based on the S3 Sedan*, the show car is equipped with a powerful five?cylinder TFSI engine. The turbocharged engine with direct injection in the show car boasts an impressive success story. Since 2010, an expert jury has already voted it “International Engine of the Year” in its category four times in succession. The 2.5 TFSI powers the production Audi RS Q3*. In the show car, the 2,480 cc five?cylinder produces 386 kW (525 hp) for a specific output of 155.6 kW (211.7 hp) per liter. With a total weight of 1,527 kilograms (3,366.5 lb), this corresponds to a power-to-weight ratio of 2.9 kilograms (6.4 lb)/hp. Maximum torque of 600 Nm (442.5 lb?ft) is available between 2,300 and 6,000 rpm. The Audi A3 clubsport quattro concept accelerates from 0 to 100 km/h (62.1 mph) in 3.6 seconds and reaches a top speed of 310 km/h (192.6 mph). Extensive modifications make this extreme performance possible. These include a large turbocharger with up to 1.5 bar of relative boost pressure and a modified intercooler. The basic concept behind the five?cylinder already makes it a special engine. 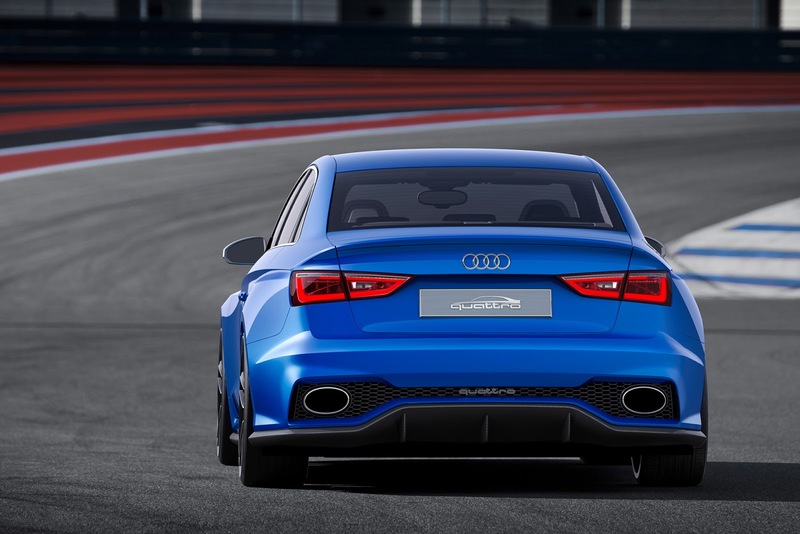 The 1?2?4?5?3 ignition sequence gives it its own unique rhythm, which in the A3 clubsport quattro concept is reinforced by an intake and exhaust system designed for maximum throughput. The characteristic sound of this TFSI engine is a throaty snarl. In addition to earning top marks for sound and technology, the 2.5 TFSI is also visually stunning. The engine in the show car is only covered by a hood made of carbon fiber-reinforced polymer (CFRP). The Audi A3 clubsport quattro concept features a seven?speed S tronic with a compact three?shaft layout. Its tall seventh gear reduces fuel consumption, and the final gear ratio has been modified accordingly. The driver can allow the dual?clutch transmission to work fully automatically in modes D and S or choose to change gears manually using the paddles on the steering wheel or the shift lever. A launch control function manages starts with maximum power and controlled wheel slip. The heart of the quattro all?wheel drive system is a hydraulically activated, multi?plate clutch on the rear axle that has been specially designed for the high torque of the powerful five?cylinder. Like the engine management system, its electronic controller is integrated into the Audi drive select driving dynamics system and takes the combination of “fun to drive” and safety to a whole new level. The clutch can direct a portion of the torque from the front to the rear axle if the driver turns sportily into a corner. Its advanced chassis enables the Audi A3 clubsport quattro concept to deliver its tremendous power to the asphalt dynamically and safely. Aluminum components in the front McPherson suspension reduce the weight of the unsprung masses. The four?link rear suspension can process the longitudinal and transverse forces separately. The steering rack of the progressive steering system is designed so that the steering ratio becomes more direct with increasing steering input. In addition, steering boost decreases as speed increases. Compared to the production Audi S3 Sedan*, the body has been lowered 10 millimeters (0.4 in) and both the springs and dampers are very taut. All three parameters can be adjusted via the struts of the coilover suspension so that the show car can be perfectly adapted to the task at hand, be it on the road or the race track. The Audi A3 clubsport quattro concept rolls on 9.5 J x 21 wheels shod with size 275/25 R21 tires. The internally vented front brake discs measure 370 millimeters (14.6 in) in diameter. All four discs are made of carbon fiber?ceramic, making them extremely lightweight and abrasion-resistant. The ESC electronic stabilization control, which can be partly or completely deactivated, supports the show car's dynamic handling with lightning-fast reactions. At the cornering limit, torque vectoring via brief applications of the brakes of the inside wheels ensures that the Audi A3 clubsport quattro concept turns easily into the corner. It provides maximum control and reliability for drifts, with the front axle straightening the show car out again as it exits the corner. The Audi A3 clubsport quattro concept is based on the modular transverse matrix (MQB). This enables a low center of gravity and a finely balanced distribution of axle loads, which is a prerequisite for the car's dynamic handling. Hot?shaped steel components in the floor of the passenger cell form a strong structure. The extreme strength of the steel allows for thin walls and thus very low weights. The lightweight body lays the foundation for the show car's low curb weight (without driver) of just 1,527 kilograms (3,366.5 lb). The result is a race car?like power-to-weight ratio of just 2.9 kilograms (6.4 lb) per hp. The Audi A3 clubsport quattro concept is 4,490 millimeters (14.7 ft) long, 1,856 millimeters (6.1 ft) wide and 1,382 millimeters (4.5 ft) tall. Its wheelbase measures 2,631 millimeters (8.6 ft). The spectacular appearance of the Magnetic Blue body immediately reveals the dynamics of the Audi A3 clubsport quattro concept. The Singleframe grille up front is framed in matt aluminum. A quattro badge adorns the grille's high-gloss black honeycomb insert, which has been optimized for high flow. The engine hood, whose front edge extends slightly over the grille and the LED headlights, sports the four rings. A distinctive element at the front of the show car is the continuous blade of exposed CFRP below the Singleframe grille. Like the winglets on a model airplane, its ends are bent upward to structure the large air inlets framed in massive edges. As with a race car, a splitter at the bottom of the front skirt increases the downforce on the front axle. The side view of the sedan has also gained some sharp accents. Two straight edges above the wheels that end in the doors contour the fender and the rear sidewall. The “blisters” give the body broad shoulders while also evoking the classic quattro models from Audi and the current RS 4 Avant*. The round fuel cover in the C?pillars and the reduced side mirrors are further typical Audi sports car elements. The side sill trims are made entirely of CFRP (carbon fiber-reinforced polymer). At the rear, a large diffuser that extends upward in the middle makes a bold statement. Three fins divide its high-gloss black honeycomb insert; two additional grilles joined by a blade conceal the tailpipes of the exhaust system. When the driver of the Audi A3 clubsport quattro concept applies the brakes at high speed, the air brake is activated. Electronically actuated, the rear segment of the trunk goes from the spoiler position to nearly vertical in the blink of an eye. At 250 km/h (155.3 mph), the air brake reduces the stopping distance by around twelve meters (39.4 ft), in part because the ESC can allocate more braking power to the rear axle thanks to the increased downforce. The cabin of the Audi A3 clubsport quattro concept seats four persons comfortably. Racing seats with high side bolsters await the driver and front passenger. The backrests are open-worked below the integrated head restraints and CFRP shells cover the backs – a visual expression of Audi's lightweight construction concept. Black faces, red needles and white numbers define the look of the instrument cluster. A shift light in the tachometer indicates when the rev limit of 6,900 rpm is reached, and the seven?inch monitor of the MMI navigation plus system displays a special graphic when the engine is started. Two large, separate buttons on the three?spoke, multifunction sport steering wheel are used to start and stop the engine as well as to choose Audi drive select modes. Black is the dominant color in the show car's interior. The seat covers feature light gray piping and contrast stitching in Sepang Blue. The headlining and the pillars are covered in black Alcantara, and the decorative inlays are brushed aluminum. Fine details underscore the sportiness of the Audi A3 clubsport quattro concept. The footrest and pedals are made of stainless steel; two open-worked bars form the handles for the door openers. The selector lever of the seven?speed S tronic sports a red ring, a CFRP badge and a Clubsport logo. The badge with the name of the show car can also be found on the instrument cluster and on the door sill trims. This year's motto is “Audi Sport,” and the Audi stand has been transformed into the Audi Pit Lane. 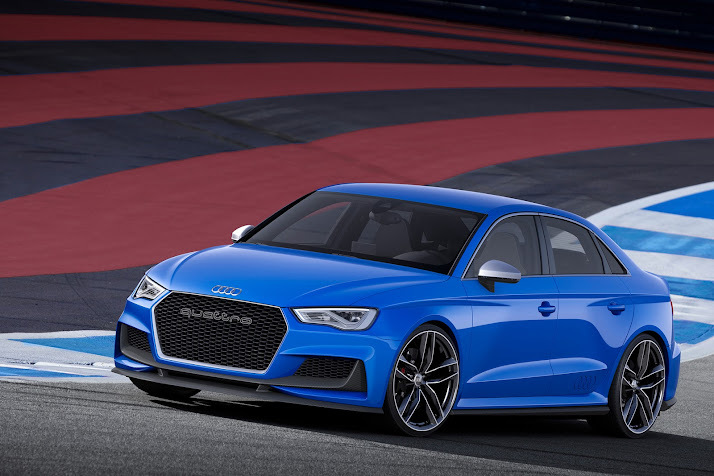 In keeping with this, the A3 clubsport quattro concept is joined by a familiar sports car from the line of show cars and ten additional high-performance models from various vehicle classes, some of which feature attractive Audi Genuine Accessories. This show car previously raised pulse rates and provided for a racing atmosphere at the Geneva Motor Show. Now the Audi TT quattro sport concept is underscoring the “Audi Sport” motto for Wörthersee with its sporty image and showing the dynamic potential of the new Audi TT* in its purest form. The engine in the Audi TT quattro sport concept makes a powerful statement. The 2.0 TFSI produces 309 kW (420 hp) at 6,700 rpm – a new benchmark in the two-liter category. Specific output is 155 kW (210 hp) per liter of displacement. The four?cylinder engine has 450 Nm (331.9 lb?ft) of torque available from 2,400 to 6,300 rpm, with over 300 Nm (221.3 lb?ft) already available at just 1,900 rpm. At a curb weight (without driver) of 1,344 kilograms (2,963.0 lb), the Audi TT quattro sport concept is an athlete in peak condition. Each hp supplied by the two?liter TFSI, which itself weighs under 150 kilograms (330.7 lb), needs to move less than 3.2 kilograms (7.1 lb). The show car accelerates from 0 to 100 km/h (62.1 mph) in 3.7 seconds. When driving, the four?cylinder unit’s pronouncedly sporty character is breathtaking. The turbocharged direct-injection engine responds closely to the throttle and revs eagerly right up to the fuel cut-off at 7,200 rpm. The S tronic shifts gears lightning fast, adding its share to the show car’s impressive acceleration. The quattro permanent all?wheel drive delivers the power to the road. For optimal weight distribution, the hydraulically actuated, electronically controlled multi-disk clutch is located on the rear axle. The quattro drive actively controls the distribution of torque between the axles in milliseconds, thus adding to the car’s dynamic handling. The car turns easily into corners thanks to torque vectoring. Power is transferred as necessary from the wheels on the inside of the curve to those on the outside. A significant part in the Audi TT quattro sport concept’s lightweight design is played by the body, which is based on the MQB modular transverse matrix. With its hybrid concept, it represents the latest evolution of the Audi Space Frame (ASF). The front end is made of steel. The passenger compartment floor comprises high-strength, hot-shaped steel components which, thanks to their extremely high strength, feature very low wall thicknesses and thus weigh accordingly little. The superstructure of the cell, the complete outer skin plus the doors and the lids/hatches are made of aluminum. The front end is dominated by flat Matrix LED headlights and the wide Singleframe grille flanked by massive air inlets. The show car rolls on 20?inch wheels with locking hubs and semi-slick tires. At the rear, the wide CFRP diffuser that extends beyond the vehicle silhouette underscores the show car’s racing character. A fixed wing increases the downforce on the rear of the Audi TT quattro sport concept. The show car's interior has been reduced to the essential. Low-set racing buckets serve as seats, featuring black four-point seat belts with white accentuating stripes. The luggage compartment offers space for two racing helmets. As in the production TT*, the controls are designed purely for the driver. The pilot of the Audi TT quattro sport concept sits behind a compact steering wheel with a pronounced rim that flattens out at the bottom. But it's not just the show car that sets new standards with respect to automotive design and sportiness. Audi has been doing the same thing with three generations of the production TT since it debuted back in 1998. At the traditional Wörthersee GTI meet, the design icon is appearing at its most dynamic in the form of the new TTS Coupé*. Aerodynamic measures such as optimization of the underbody, the side air inlets, the 18?inch wheels and the rear spoiler reduce the drag coefficient to 0.29. With its 2.0 TFSI, the Audi TTS* moves into high-performance territory: from 0 to 100 km/h (62.1 mph) in 4.7 seconds; top speed of 250 km/h (155.3 mph), 228 kW (310 hp) and 380 Nm (280.3 lb?ft) of torque available from 1,800 to 5,700 rpm. Also revolutionary is the Audi virtual cockpit, the control and display concept with a pronounced focus on the driver, and the optional Matrix LED technology, in which individual, electronically controlled light-emitting diodes generate the high beam. With the S1*, Audi is presenting a compact sports car at the GTI meet that more than lives up to its reputation with a 2.0 TFSI engine, 170 kW (231 hp) and 370 Nm (272.9 lb?ft) of torque. With turbocharging and the Audi valvelift system, it accelerates the S1 from 0 to 100 km/h (62.1 mph) in 5.8 seconds on its way to a top speed of 250 km/h (155.3 mph). The 2.0 TFSI consumes on average just 7.0 liters of fuel per 100 kilometers (33.6 US mpg) with 162 grams CO2 per kilometer (260.7 g/mi). Another highlight hitting the market just in time for the open-air season is the Audi S3 Cabriolet*. The open four-seater with a cloth top and a curb weight of just 1,620 kilograms (3,571.5 lb) is powered by a 2.0 TFSI engine producing 221 kW (300 hp) between 5,500 and 6,200 rpm. As a true sports engine with 380 Nm (280.3 lb?ft) of torque, it accelerates the convertible to 100 km/h (62.1 mph) in 5.4 seconds. The top speed of 250 km/h (155.3 mph) is limited electronically. Besides the S3 Cabriolet, another S model from the A3 model family* awaits visitors to the Audi stand – the S3 Sedan*. The sedan sets new standards with respect to performance and efficiency. The 2.0 TFSI produces 221 kW (300 hp) and 380 Nm (280.3 lb?ft) of torque, yet with the S tronic consumes on average just 6.9 liters of fuel per 100 kilometers (34.1 US mpg). 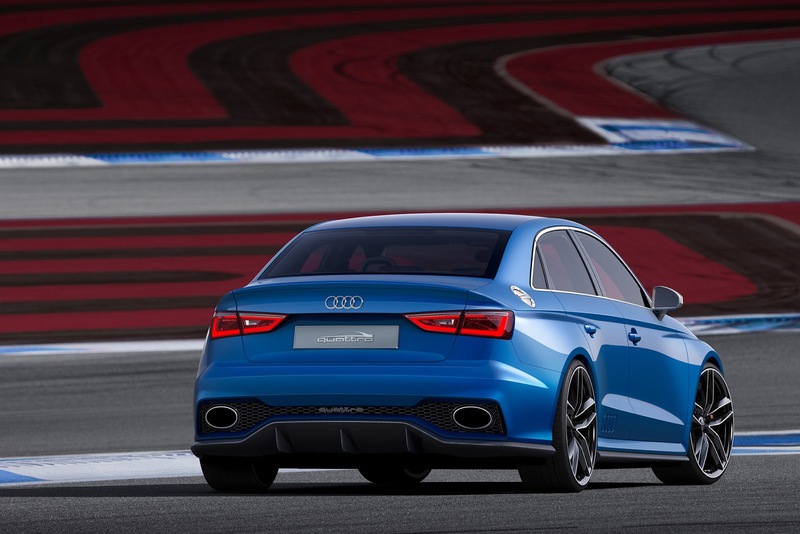 Systematic lightweight construction results in a curb weight of just 1,460 kilograms (3,218.7 lb) and enables the S3 Sedan to sprint from 0 to 100 km/h (62.1 mph) in 4.9 seconds. The RS models representing the dynamic spearhead of each model series are also at Wörthersee. 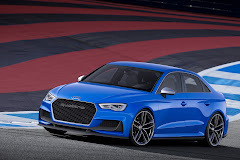 Built under the auspices of quattro GmbH, a wholly owned subsidiary of AUDI AG, the RS models feature the most powerful engines, quattro permanent all?wheel drive, extreme driving dynamics, an understated appearance and full everyday utility. The RS 5 Coupé* is a true athlete. Its 4.2?liter, naturally aspirated V8 engine develops 331 kW (420 hp) and accelerates the coupe from 0 to 100 km/h (62.1 mph) in 4.5 seconds. Standard top speed is an electronically governed 250 km/h (155.3 mph), with an option to increase this to 280 km/h (174.0 mph). The groundbreaking performer among the RS models is the RS 6 Avant*. It is lighter and more efficient than its predecessor while at the same time offering greater performance than ever. Equipped with 4.0 TFSI producing 412 kW (560 hp), it goes from standing still to 100 km/h (62.1 mph) in just 3.9 seconds. Thanks to the cylinder on demand (COD) system, which temporarily deactivates four cylinders at low to intermediate loads, the RS 6 Avant consumes on average just 9.8 liters of fuel per 100 kilometers (24.0 US mpg) – 30 percent less than the previous model. The R8 V10 Spyder* takes it up a notch with respect to performance. The V10 engine produces 530 Nm (390.9 lb?ft) of torque at 6,500 rpm and 386 kW (525 hp) at 8,000 rpm. Thanks to S tronic, the standard sprint is completed in 3.8 seconds on the way to a top speed of 311 km/h (193.2 mph) [manual: 4.1 seconds and 313 km/h (194.5 mph)]. The open-top, high-performance sports car also sets standard with respect to lightweight construction. The body – built in aluminum according to the Audi Space Frame (ASF) principle – weighs only 216 kilograms (476.2 lb). In 2013, the R8 was named a “red dot: best of the best” in recognition of its exterior design. Also awaiting Audi fans at Wörthersee is a two-wheeled attraction: the Ducati Hypermotard SP is a “special guest” at the Audi stand. The SP has all the same equipment as the Hypermotard plus some additional technology, and with its Testastretta 11°, two?cylinder engine is ideal for sports and performance-oriented riders. The same riding modes one finds on the 1199 Pangiale (high, medium, low) also help the Hypermotard SP to produce 81 kW (110 hp) at 9,250 rpm. The powerful 1.4 TFSI engine in the compact Audi A1 Sportback* produces a sporty 90 kW (122 hp). Beginning in 2015, the city car will also be available in the new color concept Macao Yellow. In combination with the black exterior finish, matt black cast aluminum wheels with a five-arm polygon design and the black headlining in the interior, the Macao Yellow interior will be a true visual highlight. Customers can also choose the eye-catching shade of yellow for certain add-on parts, such as the roof spoiler and the decals. With an output of 130 kW (177 hp), the Q3 2.0 TDI* makes no secret of its sportiness, yet feels at home on any kind of road thanks to such standard equipment as an electromechanical parking brake and the hill-start assist. At Wörthersee, Audi is presenting an outdoor variant of the Q3 with Audi Original Accessories. It offers practical gadgets for the hobby athlete: a kayak rack and a newly developed concept called the “Q3 camping tent,” which with a wind load rating of up to 70 km/h is also suitable for harsher weather. The tent structure can be removed from the supplied bag and set up in roughly seven minutes: roll it out, pump it up and the free-standing tent is ready. It can even be fastened to the open rear hatch of the Q3, if necessary. The SQ5 TDI* made history at Audi as the brand's first S model with a diesel engine. The 3.0 TDI produces 230 kW (313 hp) and generates 650 Nm (479.4 lb?ft) of torque between 1,450 and 2,800 rpm. The SQ5 TDI accelerates from 0 to 100 km/h (62.1 mph) in 5.1 seconds, yet consumes on average just 6.8 liters per 100 kilometers (34.6 US mpg). To ensure that it is also a powerful performer in everyday use, Audi offers a comprehensive range of accessories for the SQ5 TDI: a roof rack and new roof box, a bicycle rack for the trailer hitch, AWIA – Audi wireless internet access – for establishing a free Internet connection inside the car via WLAN and new cabin pockets (seatback pockets, rear seat storage bin).